Here’s another short story I wrote for The Bold Italic about crime data in SF reimagined as 3D-printed crystals. That crystal in the image above represents crimes that have happened in San Francisco in a three month period. Really bad crimes (e.g. kidnapping) are represented by larger cubes and less severe ones (e.g. possession of drugs) are smaller cubes. Confused? 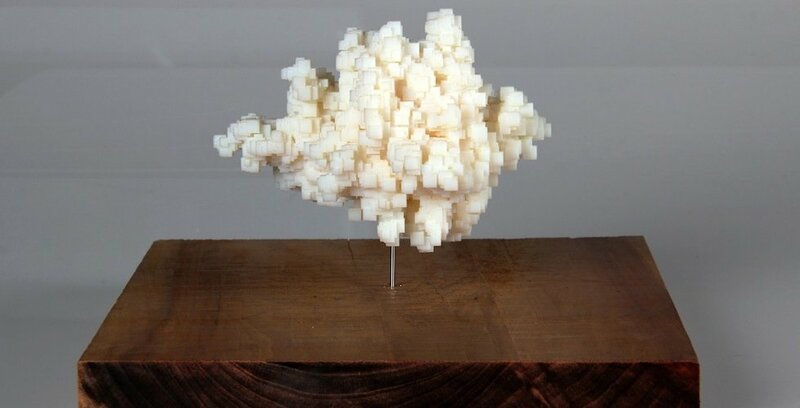 San Francisco artist Scott Kildall‘s project Data Crystals is a series of 3D-printed sculptures, generated algorithmically from open datasets for the public to use. Other cities all over the country are embarking on similar open data projects, but no one is visualizing these facts quite like Scott is. The primary question that drives Scott’s work is “What does data look like?” We’ve seen maps, we’ve seen statistics, but using data as sculptural material – like clay, plaster, or steel – helps us see what’s going on in San Francisco in an entirely new, more tangible way. I met Scott during his time at Autodesk’s Artist in Residence program, and got to check out his innovative work up close. This crystal above represents the locations of SF’s civic art collection, or works that the city has commissioned. You’ll notice a lot of cubes running vertically, representing art near City Hall. The tail on the left represents the art commissions at SFO. And this crystal visualizes construction permits in San Francisco. The cube size represents the building size – large cubes = large buildings with 300+ units. Find out more about Scott’s work via his Twitter (@kildall) and on his website. ← Look at me, I’m a content expert! Ali Wunderman is a 4th generation San Franciscan exploring the world one day at a time.